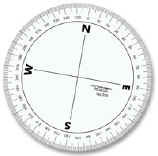 COMPASS ROSE Helpful in map reading and navigation. Made of clear plastic, 3-1/2" in diameter. Graduated 0-360 degrees in 1 degree increments.